Android apps came to Chrome OS a few years ago, with support improving over time. While Google has shown how serious they are about Chrome OS platform features, they’ve also shown their interest in furthering Android compatibility on the platform too. What’s next on the agenda for Google’s desktop/laptop operating system is for Chrome OS to support Android Oreo‘s notification snoozing feature for installed android applications. One of the best new features added in Android Oreo, notification snoozing lets you mute a notification for 15 minutes, 30 minutes, 1 hour, or 2 hours. There are no screenshots of the feature in the commit message on the Chromium Gerrit, but it does say there’ll be a button to “call the feature” so we assume there will be a clock icon on the notification like on Android Oreo notifications. 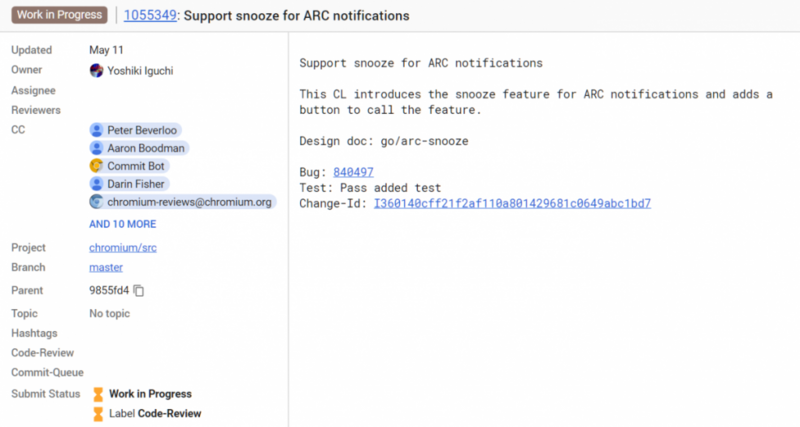 What’s interesting to note is that notification snoozing seems to only be coming to Android applications on Chrome OS and not for other system notifications. Also, unlike Android, it seems that the minimum version that is required to support the feature will be 16, so when the feature rolls out for Chromebooks you’ll start to see snoozing on most devices with Android support. It’s great to see Google further expanding Android functionality on the platform, especially as the company is starting to invest in making the tablet experience better. With the number of productivity applications already on Android, this move can only benefit device-owners. That’s not to mention the abundance of games and other apps out there too, a number of which would work just fine on a tablet or Chromebook. Let’s hope we see the update arrive soon to get a proper look at it.